I just wanna share ALL the tickets i have purchased from the promo fares usually provided by cebu pacific airline and paid via over-the-counter and internet retail banking of myBDO. The reason why I posted this is to let everyone know that I'm doing the leisure of jetsetting on a truly tight budget basis using the aids of the piso sales and travel addictiveness. I just travel by plane if I sensed cheap tickets for places I like to visit. Anyways, it just started last year only (2010) but since fuel surcharge boost the 2011's ticket prices though piso sale, it really affects my travel budget. Thus, few plane tickets purchased for 2012 travel dates due this fuel surcharge greatly almost doubles the amount of what I've bought last year. Please see the following how fortunate I am grabbing the cheapest air trip I've ever had (and its cheaper than a local aircon bus fare). By the way, all of this purchased tickets were for leisure travels only. How did i know those seat sale promos? 1. participate/lurk in online travel forums - one of the most major contributor. since i am an office staff with 9 hours duty infront of an online pc, boredom at work triggers this activity. 2. befriend fellow addict traveler - they also need comrades with same travel attitude. they will immediately inform you as soon as they sensed the promo. 3. from time to time check there websites - especially cebu pacific at 2330H. most of the time i got lucky on it. 4. subscribe to there web alerts - but most of the time the email was always delayed. 5. watch-out for holidays - whether it was government-proclaimed, special or legal holiday, most of the airlines secretly take advantage of this since most of the travelers are not in their respective office. 6. book on off-peak travel dates - off-peak months in philippines drops to the month of june to october. thus, plan your best destination to conquer domestic places and touring abroad. 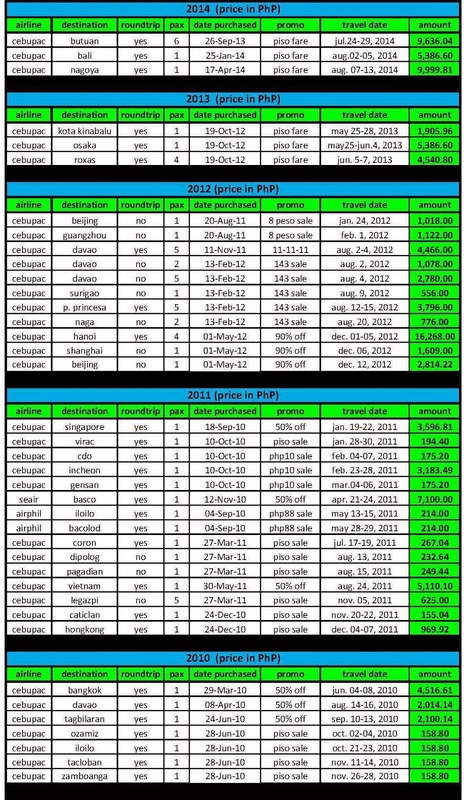 especially in cebupac and seair, most of their promos are within this dates. 7. visit tourism expo's - as far as i know, there are 2 major tourism expo's held annually. 1st is the philippine travel expo, usually on the 1st quarter of the year in SMX convention center, sm mall of asia. the other one is the philippine travel mart which is mostly 3rd quarter. 8. read/subscribe travel blogs - most of the travel bloggers share promo's on their blog or sometimes airlines give special promos only for this blog site. This amount is based on purchasing 1 pax only, since it is very hard to acknowledge the promo for 2 or more passengers. also, though i was on the piso sale promo's occurred this year, I minimized buying and decided not have a reserve tickets for 2012 due to the additional fuel surcharge. In addition, I don't know if I have still the budget and the passion on those times to urge the travel as a leisure, hehehe !! 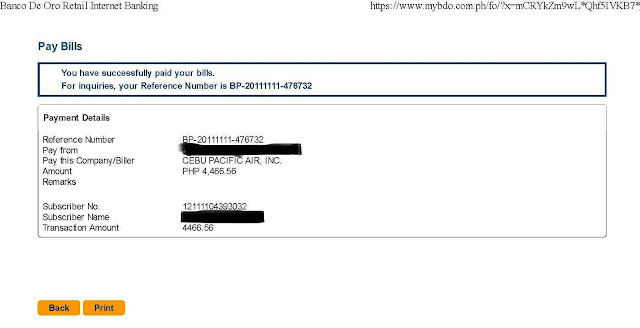 how to pay cebu pacific booked ticket using myBDO account ? - formerly known as Air Philippines. On August 31, 2009, Air Philippines ceased all operations and folded operations into Philippine Airlines and PAL Express. October 27, 2009, Air Philippines began operating all PAL Express flights on behalf of Philippine Airlines. - Southeast Asian Airlines (SEAir), Inc. operating as SEAir is an airline based in Pampanga. On 16th December 2010, Tiger Airways enter the Philippines market by proxy, without setting up an airlines in Philippines. Instead, Tiger goes into partnership with SEAir, whereby Tiger will lease aircraft to SEAir, and SEAir will operate the aircraft in SEAir's livery, using SEAir's pilot and cabin crew. - flag carrier of the Philippines, the airline was founded in 1941 and is the first and oldest commercial airline in Asia operating under its original name. wow grabe! i hope i had the budget to travel at least every month. Just in time since I need to book a flight soon. Thank you very much for sharing this information. Looks like you got most of the good deals on your flights. Timing is very important in planning for your travels. I always love it every time Cebu pacific releases these "piso" fare promos. Traveling to beautiful places around the Philippines at bargain prices is just great. These are great flights to Manila promos. I actually availed of one last month and aside from a good service, the country is just great. I hope they have more promos like this so I could go back there.